An audio making the rounds on social media, which alleged that EFCC boss was saying that nothing will happen if Fayose dies in custody, has been debunked by the agency. 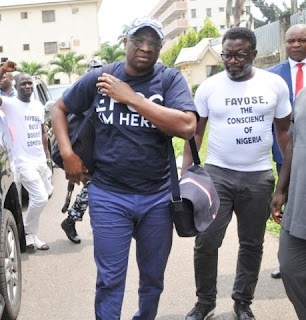 The Economic and Financial Crimes Commission in an alert Thursday flagged an audio circulating in the social media in which the Acting Chairman, Ibrahim Magu, purportedly made comments to the effect that, nothing will happen if former governor Ayo Fayose, dies in custody. According to EFCC spokesman, Wilson Uwujaren, the fake audio tape did not disclose the place where the conversation occurred and the person that Magu was supposedly talking to. "Purveyors of this fake news especially a former spokesperson of a leading political party are warned to desist”, Uwujaren said.